Charles Edgar Family History Addenda. The following Notes/Corrections/New information/additions are updates to the Charles Edgar Family History. Lloyd Fourney’s life of faith, reflected in his loving selflessness and tireless dedication to his family, to his church and to the service of others, ended peacefully after brief hospitalization. Left to cherish his memory and grieve his loss are his loving wife, Mamie Dawson; her daughter, Karen (David) Batterham and grandchildren, Craig and Katelyn, all of Edmonton; her son, Keith Dawson of Elk Point; Lloyd’s beloved sons, David (Colleen) Fourney of Toronto; Dr. Daryl (Chantelle) Fourney; grandchildren, Alysa, Alexander, Foster and Fletcher, all of Saskatoon; brother, Robert (Janice) Fourney of Ottawa; sister-in-law, Linda Fourney of Lancaster; nephews, nieces and their families: Stephen (Cecilia) Fourney; Ruth Ann (Steven) Semple; Scott (Lynn) Fourney; Sheryll Fourney and Shannon (Jason) MacCuaig; and Joyce Buckingham, beloved companion of Lloyd’s dear father, John Fourney, recently deceased. Lloyd is also predeceased by his brother, Edgar and his mother, Eileen. Two worship services will celebrate and give thanks for Lloyd’s life and work. 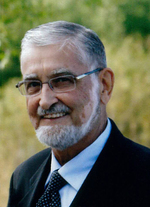 In Edmonton, Alberta, a visitation will be held from 4-8:00 p.m. on Friday, September 7, 2012 at Connelly-McKinley Funeral Home, 10011 – 114 Street. A Funeral Service will be held at 2:00 p.m. on Saturday, September 8 at First Presbyterian Church, 10025 – 105 Street. In Lancaster, Ontario, a visitation will take place from 11-12:30 p.m. on Friday, September 14 at St. Andrew’s Presbyterian Church with a Funeral and Graveside Service to follow at 1:00 p.m.In lieu of flowers, donations may be made to First Presbyterian Church for refugee support. At the Community Nursing Home, Alexandria on Sunday, October 2, 2011. Marguerite MacLeod (nee Fourney) of Lancaster, beloved wife of the late Samuel R. MacLeod and by a second marriage to the late Donald Ross. Loving mother of Glenn MacLeod (Eunice) and Bonnie Radmore both of Ottawa. Dear sister of John Fourney of Cornwall. Predeceased by one son Garry MacLeod (Moira Dionne of Sask), by one sister Edna Black, and by one grandson Kyle MacLeod. Dear daughter of the late George Fourney and the late Doretta Roberts. Also survived by 7 grandchildren and 12 great-grandchildren. 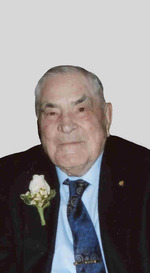 Relatives and friends may call at the Munro & Morris Funeral Homes Ltd., 46 Oak St. Lancaster (613-347-3629) on Friday, October 7, 2011 from 10:30 am until 12 noon. Funeral Service will be held at St. Andrew’s Presbyterian Church, South Lancaster on Friday, October 7, 2011 at 2 pm. As expressions of sympathy, Memorial Donations to the charity of your choice would be appreciated by the family. As a Memorial to Marguerite a tree will be planted in Memory Woods. A tree grows-memories live. Stanley Edgar son of Charles Edgar 3rd Lancater, was wounded while on Active Service. His many friends hope for his speedy recovery. A letter received by Mr and Mrs Charles Edgar 3rd Lancaster reads "their son Stanley states that his wounds are not as critical as at first feared. He is at Leicaster? England. Hopes are entertained for his speedy recovery." Mr. and Mrs Edgar have received word of the safe arrival of their son Athol in England. They also get letters weekly from John who is in the trenches in belgium. Word was received by Mr and Mrs C. S. Edgar that their son Pte John J. was suffering from shell shock at the front. John's many Glengarry friends hope for his speedy recovery. From the The Glengarry News, Alexandria, Ontario, September 18, 1942, pg. 4, col. 4. Lancaster lost one of its oldest and most highly esteemed residents in the death on Wednesday, Sept. 9th of Mrs. W. J. McNaughton. The deceased who was formerly Miss Isabel Edgar, was born in the second concession of Lancaster on Oct. 23rd 1859 and was the last member of that family. In August 1941 she met with an accident at her home on Oak Street, which necessitated her removal to Cornwall General Hospital suffering with a fractured hip. Returning to Lancaster the following month she was taken to the home of her son Robert and Mrs. McNaughton where she received every attention in the months that followed and had recovered nicely . About six weeks ago she went to visit her daughter Mrs. J. R. McLachlan and Mr. McLachlan and was apparently enjoying good health until Sunday when she suffered a stroke from which she never regained consciousness. She was a women of many beautiful traits of character. She had a kind and affectionate disposition with a cherry greeting for her friends on all occasions and will be sadly missed by all. She was a diligent church worker and was an honorary president in both The Ladies Aid and Women's Missionary Society of St. Andrew's Church. Her home was always open to members of these societies and their friends, and many pleasant memories will be cherished of gatherings held in her home. The funeral which was largely attended was held on Friday afternoon from the residence of J. R. McLachlan to St. Andrew's Church where the service was conducted by Rev. J. A. Smith assisted by Rev. G.E. Evans of Knox Church. Interment took place on the family plot in second concession cemetery. The pallbearers were six nephews, Robert Edgar, E. L . McNaughton, R. D. McNaughton, Alex F. McLennan, Lorne McBain, Thomas Ross. The casket was surrounded by beautiful flowers, a silent token of love from family and friends. Many messages of sympathy wee received by the family. Left to mourn the loss of a devoted mother are three sons and two daughters, A. E. McNaughton, R. W. McNaughton, Lancaster, John McNaughton, Manitoba, Mrs. J. R. McLachlan and Mrs. Louise Pattingale, Lancaster. The following are corrections/additions/updates to this work. Do take the time to correct each copy you have of this book and pass this infomation on to who ever you gave a copy of the book too. As you browse through this book and come across any discrepancies, mistakes, do take the time to let us know. These corrections/updates will also be sent to those not receiving this e mail who ordered or were sent a complimentary copy of this book by us. See Page 274 Ann 'Bebe' Edgar. In early 1997 we contacted a number of Galleries and Museums in Victoria, and Vancouver, B. C., as well as in Seattle Washington State and none of them were able to tell us anything about this 'Bebe' Edgar and her sculptures. She did not show up in any of their Reference books, although from the newspapers clippings of the 1940 she is described as a famous Vancouver Sculpturess and painter. -An article congratulating the candidates across the country who passed the November 1998 Profession Proficiency Examination offered by the Financial Planners Standards Council. - Garry Murdoch was listed as being one of the successful candidates. addition RE: see page 71 under Pearl MacDermid. about Feb. 16.99 note from James Edgar, Merville, Sask. p.71 Pearl died Feb. 14.1999 in Toronto. B.C. passed away at the age of 84 years. He is survived by his loving wife of 62 years, Helen, three sons: Robert (Radja) of Lafaivre, Ont., Stephen (Jane) of Kamloops, James (Jodie) of Melville, Sask., one daughter, Marylen (Terry) McKenzie of Chelmsford, Ont., thirteen grandchildren and six great grandchildren. He also leaves his sister-in-law Pearl Edgar of Toronto and daughter-in-law Margie Edgar of Kamloops as well as numerous other relatives. Mr. Edgar was predeceased by his eldest son John in 1988, as well as by his six brothers and two sisters. Les was a long-time resident of Kamloops, settling here in October 1929. He was a contractor and builder for a number of years and also worked as a millwright in various mines in the area. Valley Savings Credit Union. He loved travel, reading and took great interest in the activities of his family. Rev. George Peters will conduct the Funeral Service in St. Andrew's Presbyterian Church, 6th and Douglas St., on Thursday, October 3, 1991 at 11:00 A.M. Interment will follow at Pleasant Street Cemetery. If friends desire, donations may be made to Kamloops Hospice Society, 311 Columbia Street, Kamloops, B.C. V2C 2T1, in memory of Mr. Les Edgar. Schoening Funeral Service in care of arrangements." Birth Place: Royal Inland Hospital, Kamloops, B.C. Birth Place: Grace Hospital, Vancouver, B. C.
Marr Place: Burnaby Memorial United Church, Burnaby, B.C. Birth Place: Burnaby General Hospital, Burnaby, B.C. Chr Place: Oak Ave United Church, Surrey, B.C. Occ: Family and Youth Coordinator, Notre Dame du Portage Church, Kenora Ont. Birth Place: Sioux Lookout Hospital, Sioux Lookout, Ont. Marr Place: Catholic Church, Sioux Lookout, Ont. Birth Place: Dryden General Hospital, Dryden, Ont. Chr Place: Sacred Heart Church, Sioux Lookout, Ont. Chr Place: St. Joseph's Church, Dryden, Ont. In 1958 Jean & her husband were in Winnipeg, Man. Kimberley Ann [dau of Ronald McRae & Caroly Murray ] and Rodney Craig see page 237. It takes a special person to devote his life to the ministry, and an even more outstanding one to receive an honourary doctorate for doing it. Lancaster native Rev. Lloyd Fourney qualifies in both respects and received an d honourary doctorate from his alma mater the Presbyterian College in Montreal at its graduation last week. For Lloyd Fourney, recognition isn't what draws him to the ministry, it's helping others that touches his heart. "In the church, you meet a lot of wonderful people, said Fourney. From weddings, to funerals to sickness, Fourney is able to instinctively connect with and comfort people. "You're privileged to be in private parts of their life, " he explained. Seeing that relationship as a privilege is what draws Fourney close to his congregation and to the numerous homeless and refugees he helps. His church in Edmonton is a corner stone in the city foodbank and has sponsored refugees from as far away as the Sudan, Iraq, Zaire, Rhwanda and Ethiopia. 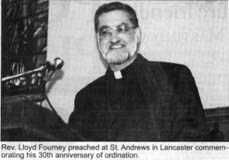 Rev Lloyd Fourney preached at St. Andrews in Lancaster commemorating his 30th anniversary of ordination. This effort to go one step beyond duty is what prompted the college to offer him the doctorate. Since 1985, the church has sponsored 15 refugees and given support to many other newcomers to Canada. He is a strong advocate for human rights and works hard to reunite refugees with their families. At least one family was so thankful, they asked, Fourney to name their newborn child, a custom in their culture. But blending different cultures is a skill Fourney has fine tuned. "I'm father Lloyd to a lot of them," he joked. He served as minister in North Battleford, Saskatchewan, before heading to Moose Jaw in 1973 and finally to Edmonton in 1983. Throughout his career he has served on committees of the church courts including General Assembly, The Board of Congretional Life, Presbyterian World Service and Development and the International Affairs Committee. He has also served as Moderator of the Presbytery of Assiniboia, The Presbytery of Edmonton, the Synod of Saskatchewan and of Alberta. Fourney received his doctorate only days after celebrating his 30th anniversary in the ministry, preaching the sermon at St. Andrews in Lancaster on May 9, the very same day he was ordained. "It was very affirming in to see so many familiar faces he said. Some of those faces were the same ones present at the very first sermon he gave at the age of 17 as part of the youth group. All went well until he realized church had finished 20 minutes too early. "I was young and probably spoke too fast," he laughed. But Fourney had a feeling he would be a minister when he was as young as four or five. There is a picture of him, he confesses, at the age of five in a clerical gown and a bathing suit - a strange mix for youngsters at play. But the comical photo was a sign of things to come. In 1969 he was ordained after receiving a Bachelor of Divinity degree from Presbyterian College., It is an event which is still very clear in his mind. The "laying of hands" ceremony, where all ministers present put their hands on his shoulders to initiate him into the ministry is pressed firmly in his mind. "You never forget the weight of that and the responsibility you're taking on," said Fourney. The responsibility was not one he took lightly. Being available to his congregation is something very important to him. Some days it is in their grief others in, their joy, but one is usually followed quickly by the other. Fourney reminisces about one winter which had seen the deaths of some young members of the church very close to Christmas. The mood in the, holiday season was solemn. "How do you do a Christmas service then?,"
But that same year, a young mother received a heart transplant on Dec.
23. He went to see her a few, days after the operation and found a radiant young woman, ready to celebrate life again. "You feel you don't have the energy to do one more thing, it was such a lift to see her. "It's those kind of moments that sustain you." Stress and grief may be parts of life, but "out of it sometimes comes beautiful things." , wife of John L. Morrison of Lot 18, Con. 6, Lancaster, on Thursday, 29th January, 1914, at the early age of 41 years, was a shock to the whole community who held the deceased in very high regard. The deceased had suffered from Diabetes for upwards of a year, but was able to follow her usual duties until the previous Sunday. She leaves to mourn her loss, her husband, five young children, and two sisters, Mrs. R. A. McGregor of Dalhousie Station, and Mrs. Jas. Priest of Montreal, as well as a legion of friends who appreciated her ever youthful and jolly disposition. The funeral on Saturday to the cemetery at Dalhousie Mills was largely attended not withstanding the storm (over 60 carriages) where the service was conducted by Rev. J. A. Matheson.